Renacci, an accountant and businessman, was first registered as a lobbyist in 2008, when he and two others launched Smokerise International Group, a consulting firm, in Wadsworth, Ohio, where Renacci had just served as mayor. In 2010, Renacci was elected to Congress in Ohio’s 16th District. Smokerise still listed him as a registered lobbyist when he entered Congress in January 2011 until May 2011, when the firm terminated. But Renacci’s campaign says paperwork had been filed by the company’s lawyer ending Renacci’s registration as of Aug. 1, 2009. However, another form needed to be filed as well, and that amended form for 2009 wasn’t submitted until March 29 of this year. There’s no indication on any of Smokerise’s various filings from 2008 to 2012, which list no clients, that Renacci did any lobbying. All but three of its 21 federal filings say there was no lobbying activity, and the three that list some activity describe it as “consulting” by the firm’s lawyer. Brown’s campaign communications director, Preston Maddock, maintains that Renacci “was a registered lobbyist while serving in Congress.” But that’s not the whole story. The AP found “five reporting periods from 2008 to 2010 while the Ohio Republican was registered as a lobbyist when he either failed to file the required disclosure form or reported giving no political contributions when he had given.” Lobbyists are required to disclose contributions they make of $200 or more to federal politicians or candidates, as well as political action committees and party committees. The campaign told the AP that Smokerise’s registration of Renacci as a lobbyist had been precautionary. Technically, back in 2011, Renacci was registered as a lobbyist for four months after he was sworn in for his first term as a U.S. representative, even if he didn’t do any work as a lobbyist. He, in fact, filed a mid-year lobbying contribution report for 2011 on June 26, 2012. But his campaign describes that as a mistake, saying Mills had filed paperwork in 2009 terminating Renacci’s registration as of Aug. 1 of that year. That paperwork isn’t available online, and Mills had to file an amended 2009 third quarter report, retroactively listing Renacci as no longer being a lobbyist. That amended report was filed on March 29, the day after the Associated Press story ran. Martinez, Renacci’s campaign spokeswoman, sent us a Lobbying Disclosure Act “account summary” that says Renacci was “inactive” as of Aug. 1, 2009, though there’s no date on that form. Martinez said Mills filed the amended report when it appeared Renacci’s termination date wasn’t accurately listed in that report. Renacci continued to file lobbying contribution reports until Smokerise’s termination, but Martinez told us that was an error. She said that Smokerise “inadvertently” continued to file contribution reports on his behalf. Those forms are signed, electronically, by Renacci. Martinez emphasizes that Renacci never engaged in lobbying. “It says, ‘Jim Renacci’s been a lobbyist even while in Congress,’ which is true,” he said in an email to FactCheck.org. Sure, Renacci was briefly registered as one at the time, but the claim leaves the false impression that Renacci had “been a lobbyist” who actually did what lobbyists do — lobby. The ad includes the sound of a cash register three times when it mentions the word “lobbyist,” leaving the impression that Renacci earned money as a lobbyist. And while Renacci’s paperwork wasn’t in order in the past, his former consulting firm has now retroactively terminated his registration as of 2009. That’s part of the whole story, too. 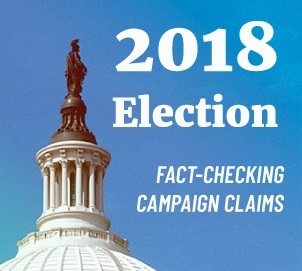 The first claim concerns a party-line vote in November 2016 on “ordering the previous question,” a measure that could allow the minority party to bring legislation to the floor. But Democrats lost that battle in the GOP-controlled House by a 231-181 margin. The Democratic leader’s website says the Democrats would have forced a vote on a bill to amend the Presidential Transition Act of 1963 to block registered lobbyists from holding positions on presidential transition teams. At the time, the Trump administration transition team was facing criticism for including several lobbyists. So, Renacci didn’t make it easier for lobbyists to serve on transition teams. Instead, he voted, along with his party, to block a vote on a measure that would make it harder for lobbyists to serve on transition teams. We take no position on the failed motion or the rule change, but the underlying premise of the ad — that Renacci has “been a lobbyist even while in Congress” – is misleading. There is no evidence that Renacci ever lobbied Congress.